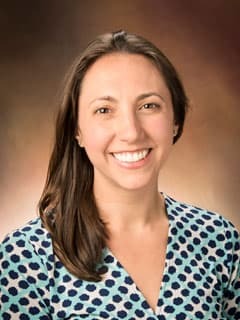 Bridget C. Godwin, MD, is an Attending Physician in the General Diagnostic Gastroenterology (GI) Program at Children's Hospital of Philadelphia. Whelan KA, Merves JF, Giroux V, Tanaka K, Guo A, Chandramouleeswaran PM, Chang S, Benitez AJ, Dods K, Que J, Masterson JC, Fernando SD, Godwin BC, Klein-Szanto AJ, Chikwava K, Ruchelli ED, Hamilton KE, Muir AB, Wang ML, Furuta GT, Falk GW, Spergel JM and Nakagawa H. Autophagy mediates epithelial cytoprotection in eosinophilic oesophagitis. Gut. 2017 Jul;66(7):1197-1207. Erlichman J, Hall A, Dean A, Godwin B, Mascarenhas M. Integrative Nutrition for Pediatrics. Curr Probl Pediatr Adolesc Health Care. 2016 Jun;46(6):165-71. Godwin B, Taylor JS. “Diaper and Perianal Dermatitis.” The Color Atlas of Family Medicine, 2nd Ed. Richard Usatine (ed). New York: McGraw Hill Medical, 2012. Godwin B, Whelan K, Wilkins B, Klein-Szanto A, Benitez A, Gross J, DeMarshall M, Elci O, Dellon E, Falk G, Spergel J, Muir A, Nakagawa H. Persistent Epithelial Changes in Inactive Eosinophilic Esophagitis: A New Tool for Understanding a Poorly Defined Population. Abstract to be presented as Poster Presentation at Digestive Disease Week. Chicago, IL. May, 2017. Wehrman A, Godwin B, Rosario S, Fulkerson P, Muir A, Lin H. Clinical Features and Management of Eosinophilic Gastrointestinal Disease in Pediatric Liver Transplant Recipients: A Longitudinal Case Series. Abstract to be presented as Poster Presentation at Digestive Disease Week. Chicago, IL. May 2017. Whelan K, Godwin B, Wilkins B, Modayor Chandram P, Sharma M, Benitez A, Gross J, DeMarshall M, Falk G, Muir A, Nakagawa H. Age-associated alterations in esophageal epithelial biology contribute to fibrosis in eosinophilic esophagitis. Poster of distinction; Digestive Disease Week, Chicago, IL, May 2017. Godwin B, Whelan K, Wilkins B, Benitez A, DeMarshall M, Falk G, Spergel J, Muir A, Nakagawa H. Persistent Epithelial Changes in Inactive Eosinophilic Esophagitis: Is Inactive Really Inactive? Abstract presented as Poster Presentation at The Children’s Hospital of Philadelphia Poster Day. Philadelphia, PA. February 2017. Godwin B, Whelan K, Wilkins B, Benitez A, DeMarshall M, Falk G, Spergel J, Muir A, Nakagawa H. Persistent Epithelial Changes in Inactive Eosinophilic Esophagitis: Is Inactive Really Inactive? Abstract presented as Poster Presentation at The World Congress of Pediatric Gastroenterology, Hepatology and Nutrition. Montreal, CA. October 2016. Godwin B, Whelan K, Benitez A, Klein-Szanto A, Spergel J, Falk G, Muir A, Nakagawa H. Persistent Epithelial Changes in Inactive Eosinophilic Esophagitis: Is Inactive Really Inactive? Abstract presented as Oral Presentation at Digestive Disease Week. San Diego, CA. May 2016. Whelan K, Giroux V, Merves J, Godwin BC, Masterson J, Benitez AJ, Que J, Muir AB, Furuta GT, Spergel JM, Nakagawa H. Esophageal epithelial autophagy flux regulates Eosinophilic Esophagitis Disease Activity. Abstract presented as Poster Presentation at Digestive Disease Week. San Diego, CA. May 2016. Godwin B, Whelan K, Benitez A, Klein-Szanto A, Spergel J, Falk G, Muir A, Nakagawa H. Persistent Epithelial Changes in Inactive Eosinophilic Esophagitis: Is Inactive Really Inactive? Abstract presented as Poster Presentation at University of Pennsylvania Department of Medicine’s Celebration of Research. Philadelphia, PA. May 2016. Godwin B, Demuynck S, Maxwell E, Baldassano RN, Grossman A, Kelsen J, Albenberg L. Efficacy of Antibiotic Combination Therapy for Refractory Inflammatory Bowel Disease: A Single Center Case Series. Abstract presented as Poster Presentation at The Children’s Hospital of Philadelphia Poster Day. Philadelphia, PA. February 2016. Godwin B, Demuynck S, Maxwell E, Baldassano RN, Grossman A, Kelsen J, Albenberg L. Efficacy of Antibiotic Combination Therapy for Refractory Inflammatory Bowel Disease: A Single Center Case Series. Abstract presented as Poster Presentation at North American Society of Pediatric Gastroenterology, Hepatology and Nutrition Annual Meeting. Washington, DC. October 2015.